“You sure this is all gonna fit?” my friend asks worriedly, folding down the backseat. “Totally.” I reply with a smile. “Trust me.” Arms stretched wide, I place the first canvas into the trunk, then the next one. If only she knew I had already done this twice that week. I place the last canvas on top and close the door. #VenusOnMars challenged me to work at a scale larger than I had ever worked on before. Just one of the five walls of the gallery was over 48 feet long. To me, each painting needed to be at least five feet tall to have a sense of presence in the space. The same five-foot-tall canvas covers a fraction of a gallery wall, yet barely fits into an SUV. Bringing these big, beautiful canvases into my world has also brought a fresh sense of spatial awareness. I load the canvases onto an industrial hand truck and into the studio’s freight elevator–recent additions to my workflow. With a screwdriver, I gently pierce the back of the taut plastic wrap. The thin sheets float down in waves. I hammer a few nails into the studio wall and place the canvas on them. I perform my usual preparatory rituals: tie on my apron, tape down two sheets of palette paper onto the table, and scoop onto them a few piles of paint. 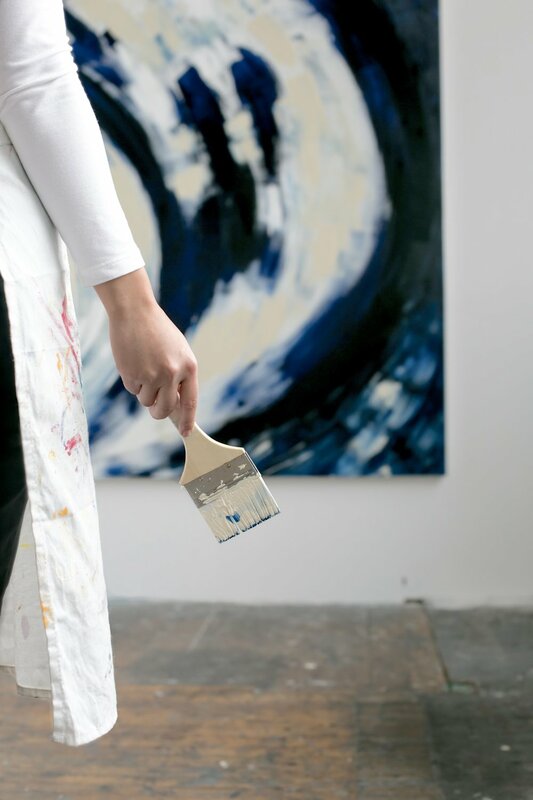 I pick up a brush and load it with blue. At two inches wide, this brush is one of the biggest ones I had worked with so far. My free hand cups the space under the bristles to catch any spills as I step towards the canvas. I take a deep breath, dropping out of my thinking mind and into my gut. Ok, here goes. I spread the cool, buttery paint in an arc across the canvas. Again and again. I return to the palette, load a clean brush with beige paint this time, and keep going. With each stroke, the layers build on each other and around each other, side by side. This makes no sense. I’m doing this all wrong. My brush is out of paint. As I return to my palette, I take a step back and scan my work. Hmm. I take a few more steps back. What before seemed like a mess of colors now looks totally different. Harmonious even. I smile, pleasantly surprised. Seems straightforward, right? Just take a step back! Zoom out. But it’s a deeper learning to feel a lesson in your body–to add it to your muscle memory, to let it flow into other parts of your life. Such that when something comes up in my world beyond the studio, I remember to zoom out and take a step back. It’s April 2015. It’s Saturday morning. I’m in an empty drawing studio at the San Francisco Art Institute. I’m an hour early for our last class of the semester, our final critique. A level, a hammer, and a few boxes of nails in hand, I stand on a chair and hang thirty of the drawings I had selected from my daily drawing project. Row after row, I think about how I had gotten to that place. I had started making art again because I was feeling stuck. At twenty-eight, I had more money, connections, and work experience than I had in my whole life, yet I felt totally incapable. I had a hunch that if I could reconnect with my creativity, I could get unstuck in other parts of my life. I place the last drawing and climb down from the chair. I step back. Zooming out, I survey the wall of work and smile. I had created something larger than myself. When something has value, we say it “matters.” It’s also the word we use to refer to things that take up space and have mass. (Interestingly, both have the same Latin root word mater, meaning “mother.”) Like Gaga, I’m 5’2”. As a Filipina-American woman, I’ve spent most of my life concerned with not taking up space, not burdening others. So, in my studio, standing in the presence of a canvas almost as tall as I am, in preparation for my first solo show, meant the world to me. To the women in my life, to the women who came before me, and to those who will come after me. I’m back at my studio. The show has closed. After a period of Mindful Recovery, I’m ready to discern my next chapter. I unfold a large white tarp onto the studio floor and sit down, cross-legged. This tarp is my other big, beautiful creative canvas. I pull out a pad of newsprint and a Ziploc bag of Sharpies. What’s next? I've had this question on my mind for over a year now. Every time I went there, I felt constricted and confused–kind of like playing Twister. During Mindful Recovery, I asked myself: "I say I'm open to all possibilities, but am I really?" I knew what I wanted next, but my inner critic had been artificially closing off options that were viable but not “externally validated.” I needed to test these ideas in real life. Most of all, I simply needed to own what I wanted. I zoom out: “What life do I want to create–now, two years from now, four years from now?” “What can happen if I considered 10 years?” In Silicon Valley, when we think of scale, we think about stuff like the number of users or machines. What opens up when you think of scaling time itself? I take a deep breath, dropping out of my thinking mind and into my gut. Ok, here goes. Sharpie in hand, the ideas start to flow. Page after page of possibilities. I feel expansive and fresh. It can be scary to zoom out–the vulnerability of putting a stake in the ground, making tradeoffs, communicating my visions to others who may differ in their values or points of view. Not to mention the discomfort of facing uncertainty head-on. In the physical world, there's even a name for the fear of heights (acrophobia). Before long, I’m swimming in a sea of papers. “Ocean” comes from the Greek word okeanos, meaning “the great river or sea surrounding the earth.” Sounds about right. The letters on each page become lighter as the Sharpie runs out of ink. I stand up and walk among the papers, rearranging some of them as I go, to more clearly draw relationships between them. From high up, I can see how zooming out can be exhilarating. A chance to slow down, to savor the beauty of the landscape, seeing how far you've come. To enjoy the peace and that comes with seeing how the day-to-day fits into the long-term arc. To stand before the wonder, the magic, and the mystery of what lies ahead. When I feel complete, I gather the papers in a loose stack. I’m ready to transform these ideas from one big, beautiful canvas to another.